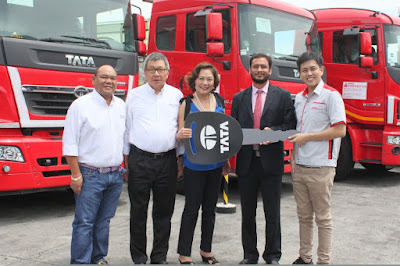 Pilipinas Taj Autogroup, Inc. (PTAJ), the exclusive distributor of Tata Motors partners with one of the largest freight logistics companies in the country, MMG Logistics. Through this partnership, Tata is supplying 13 brand-new commercial vehicles including 10 Prima 6038.S, a Prima 4438.S tractor head, a SFC407 truck, and a Super Ace). Present during the turnover were PTAJ Chairman of the Board, Mr. Dave Coyukiat, PTAJ President, Mr. Jon Fernandez, Jr., PTAJ Vice President, Mr. Arthur Balmadrid, PTAJ Sales and Marketing Division Head, Mr. Rico Macalintal, PTAJ Technical and Engineering Division Head, Engr. Ramil Mendoza, PTAJ Parts and Service Division Head, Mr. Fidel Portillo, MMG Group of Companies President and CEO, Mr. Jardine Gerodias, and MMG Group of Companies Chairwoman Emeritus, Ms. Marissa Gerodias. “The Prima tractor heads are our proposed business solution for fleet owners. These proven trucks will be able to multiply their returns by delivering more goods using a smaller fleet of more productive vehicles. This is aligned with MMG Logistics Corporation’s focus on providing efficient, safe, and reliable logistics service,” shared Mr. Fernandez. “We are very proud to be the first to acquire these world-known tractor heads here in the Philippines. This newly established business relationship shall continue for many, many years to come,” added Mr. Gerodias.